If orange is the new black, then Tuesday is the new Monday! My apologies for failing to post yesterday. I got caught up in the end of summer school and grading. The Englyn cyrch is a Welsh poetic form consisting of any number of quatrains. In each stanza, the lines are composed of seven syllables, with lines 1, 2, and 4 sharing an end rhyme. The end rhyme of line 3 rhymes with a middle syllable (3rd, 4th, or 5th) or line 4. Here's what the pattern looks like. You can read more about Englyn at Wikipedia. That's it. Easy-peasy, right? I hope you'll join me this week in writing an Englyn cyrch. Please share a link to your poem or the poem itself in the comments. I've been searching a bit online for some "new" and different poetry forms. I discovered a site, The Writer's & Poetry Alliance Club, that not only explains traditional poetic forms, but includes numerous invented forms as well. The diatelle is syllabic form with a rhyme scheme. It looks a bit like a double etheree, but it is different. Here are the guidelines. That's it. Easy-peasy, right? I hope you'll join me this week in writing a diatelle. Please share a link to your poem or the poem itself in the comments. Sigh ... I really procrastinated this month and now I'm not so happy with my poem. I guess that's alright. My energy has been focused on summer school, so writing has been coming in fits and starts. The poem I chose to write in the style of, as did a few of my poetry sisters, is entitled Turtle. Read and listen to the poem in its entirety. I had a hard time settling on a subject. I started a poem on the heron, inspired by a morning walk and watching our local heron wade through the mud near some sunning turtles. It didn't go very far. I also tried mongoose, cockroach, and bat. I suppose this was hard for me because I'm fascinated by these animals and don't see too many drawbacks to their design. I finally settled on the naked mole rat. The poem is entirely too didactic, but I enjoyed working on the internal rhyme in the piece. In fact, I ran it through The Wall Street Journal analyzer. (Props to Laura Purdie Salas for sharing this!) Their algorithm breaks words into component sounds and then groups similar-sounding syllables into rhyme families, which are color-coded. You can learn how they did it at How WSJ Used an Algorithm to Analyze ‘Hamilton’ the Musical. Here's what a portion of my poem looks like. So, without further ado, here's my first draft, along with a picture of the animal that inspired it. I'm not sure I'll be revisiting this exact one, but I like Ryan's poem as a mentor text and will definitely try to tackle another subject. Image licensed under Creative Commons Attribution 2.0 License. Posted to Flickr by Jedimentat44. 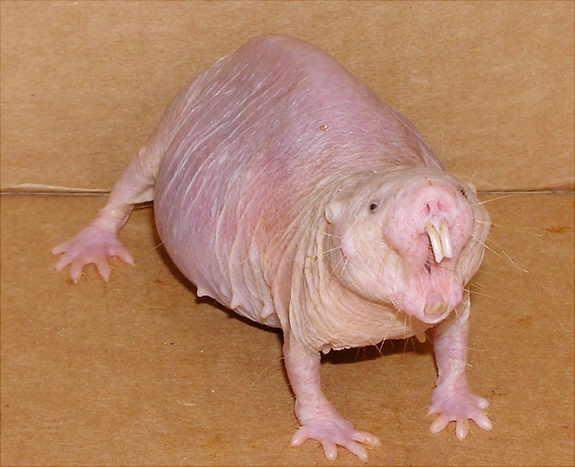 Who would be a naked mole rat who could help it? by birth, she labors for her queen. minding pups, life is busy enough. to define, closer relation to the porcupine.